The Six of Disks. Success. Power. Wealth. Resources. Knowledge. Respect. Reward After Work. Inequality. Quiet Triumph. Reassessment. 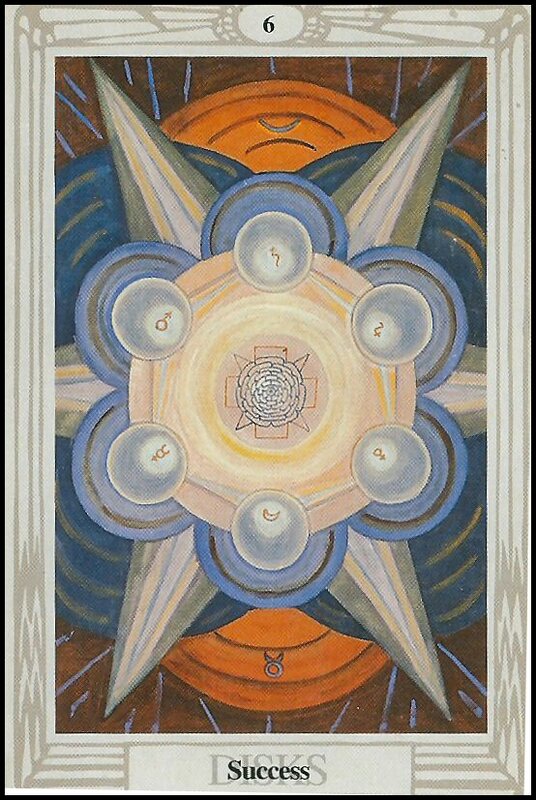 The Six of Disks corresponds to the Sefirot of Tiphareth; the Conscious Harmony of the suit of Disks and the element of Experience. Tiphareth represents the central balance of the Suit, being located at the center of the Tree of Life. This card, then represents the harmonious nature of the Suit of Disks, and that which is achieved through experience, taking both of the meanings of the Sefirot literally (as is in the spirit of Disks). When one with experience goes out into the world to live their life, what do they often manage to do? Achieve Success. This card represents what one might possess after achieving material and practical success; Wealth,Power, Resources, and Respect. It represents also the idea of receiving a Reward After Hard Work. It encompasses many of the previous themes of the Suit of Disks, and represents what one can expect if one works with the element of Earth under the guiding light of Kether. This card represents also a sort of Quiet Triumph; success can certainly be considered a triumph, but is rarely celebrated like a military victory would be. The kind of triumph this card represents is the more common form of triumph in the real world; that of living comfortably after hard work. On a slightly darker note, this card also represents Inequality. Not everyone succeeds; many fail. For every action, there is an equal and opposite reaction; for everyone who succeeds, there is someone who fails. In many cases, in our hypercapitalist world, success is achieved at the expense of another. 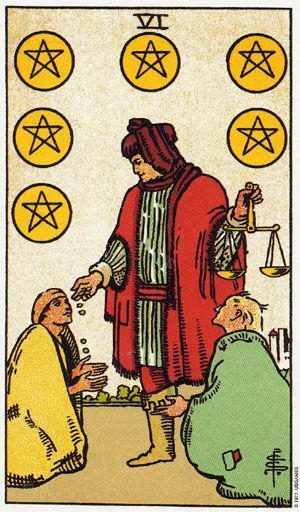 It is important to keep this thought in mind; while this card indicates worldy (not heavenly or spiritually, mind) success, it also points out the existence of the next card in the Suit; Failure. It points out that a dichotomy does exist, and advises us to be wary of it. The Rider-Waite art best illustrates the concept of inequality; a wealthy man (with the appearance of a merchant, who worked for his wealth) stands above two less fortunate men who are kneeling, giving each of them gold, while also carrying a scale; the wealthy and successful man has obtained material resources and power over those who have been less successful in life’s endeavors. The presence of the two poor men also directly points out the inequality inherent in life, and the existence of the complement of Success. The Thoth art shows Six Disks arranged in a stable hexagonal pattern surrounding a flower blooming (plants grow only after hard work in caring for them) at the center of a cross (representing dedication and sacrifice to get to where you are). These six Disks, in turn, rest upon six larger, more stable Disks, indicating a degree of stability and a sense of power. The idea of Success is also here directly, as there are in fact twelve Disks on this card, rather than six. In a reading, this card suggests that you examine the role of success, respect, justly earned reward, power, knowledge, and wealth in your life. It asks you to look at your life and think about why you have been successful (or not successful). It advises you to work hard to obtain your reward; lounging around won’t get you anywhere. Are you respected? Do you have any power? Knowledge? Reversed, this card’s energies are twisted, blocked, or hidden somehow. This card could indicate that you need to Reassess your current life-path or situation, or stop and consider if you are where you want to be. When reversed, this card also can emphasize the nature of inequality, and bring your attention to the idea of failure in terms of the opposite of success.